The Colorado Petition for Child Custody can be obtained by searching online or through the state court. 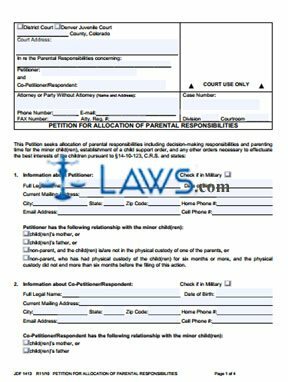 The form should be filed when two parties come to an agreement for the custody of their children. Should custody be contested, additional forms will need to be filed along with additional court proceedings. 1. First, fill out the case caption information at the top of the form. Indicate the court where the case is being heard and the names of the petitioners. If represented by an attorney, they must provide their name and contact information. 2. Supply the case number, division, and courtroom. 3. For parts 1 and 2, put the full information of both the petitioner and co-petitioner of the child or children whom custody of is to be determined. Supply a current address, phone number, e-mail address, and military status for each parent. 4. Indicate the relationship of each petitioner to the children. 5. For parts 3 and 4, provide the names of the children in the case. Use part 3 if the children have lived in the state of Colorado for the past 6 months. If not, use part 4 and supply the previous addresses where the children lived. 6. Read through all of the remaining parts, ensuring that each party agrees to the stipulations made in the form. 7. If the children have been involved in any previous court proceedings, list them in parts 8 and 9. 8. If any parties who are not petitioners have current custody of the children, they must be identified in part 10. 9. You must use part 11 to state why child custody should be granted according to your petition. You may give your explanation in the provided lines or you my attach an additional sheet to explain the petition. 10. If the parents or the children have received any benefits from the Department of Human Services, this must be stated in part 12, with the case number and contact information for each instance. 11. If any restraining or protection orders have been granted for or against the named parties, they must be disclosed to the court in part 13. 12. Complete the form by certifying the petition with both parties providing their signatures and contact information. A notary is required to complete the form.